One of our favorite skinny secrets ... don't drink your calories! We always choose ice water over drinking a soda, sugary ice tea or lemonade. One 12oz can of soda has around 150 calories. If you trade one soda each day for a glass of ice water, you would save over 1000 calories each week! Enough motivation to drink more water? We know plain old ice water can be a bit bland after a while so a couple times a week we make a pitcher of infused water. No not the artificially sweetened chemical water but homemade flavored water! 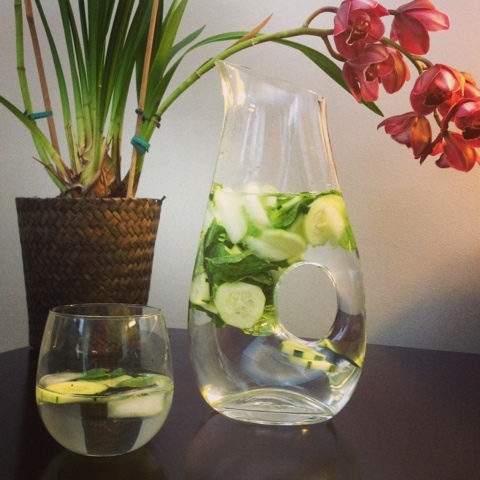 Today we are making a pitcher of clean, refreshing cucumber mint water. Just add sliced cucumbers & fresh mint to a pretty pitcher. Add ice, fill with water and enjoy! Thanks Lisa! So happy you found us :) Happy Friday to you too! Hi ladies can someone tell me how this bloglovin works? Is it true that the GFC will end? I am new to this and I am not getting this. What would happend with the gfc followers? Does anyone know anything about this? Would really appreciate the help. Thank you so much ladies. Great idea, and reminder about the sugary drinks!